Fallen apples, damp earth and the cidery smell of last year's apples in the hay loft. Sift the flour and a pinch of salt into a bowl and make a well in the centre. Use a wooden spoon to mix the egg slowly into the flour till it starts to form a paste. Beat in the milk, bit by bit, then mix in 85ml water and the butter, until you have a smooth batter. Strain into a jug and rest for 30 minutes. Heat a little oil in a small (15cm diameter), heavy frying pan over a medium-high heat. When the pan is very hot, add 2 tbsp batter, evenly coating the pan in a thin layer. After 1–2 minutes, as the batter sets and forms small bubbles, loosen the edges with a greased palette knife and flip over. Fry for 1 minute more, then slip onto a plate. Add a little more oil to the pan and repeat, reducing the heat a little. You should get 12 pancakes. Stack, separated by greaseproof paper; cover with foil and set aside. Peel, quarter, core and thickly slice the apples into a bowl. Toss with the lemon juice. Melt 55g butter in a large pan on a medium heat and stir in the apples and sultanas. Fry for 3 minutes, stirring, until the apples are golden and just tender. Reduce the heat, mix in the sugar and 2 tbsp calvados, and cook for 6–7 minutes more until the apples are soft and juicy. Tip into a bowl. Preheat the oven to 180C/gas 4. Butter a gratin dish. Spoon some cooked apple over each pancake. Fold in half to cover the mixture, then fold in half again and put in the dish. Dot with the remaining butter and cover the dish with foil; bake for 20 minutes. Meanwhile, whisk together the cream and 1 tbsp calvados until the cream forms soft peaks. 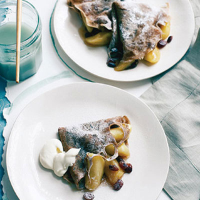 Dust the pancakes with icing sugar; serve with a dollop of the cream.